We search files or things using Google Search Engine, if you use Google to find PDF documents then you may not find proper result. If you are searching only PDF file, then it is good to use PDF search engines. We all know there are so many PDF search engines are available to search pdf documents. Do you think all the PDF search engine provide value to your search?? If not, here is new PDF search engine to search only PDF files. PDF Team is also similar to other PDF search engine, there is no big difference when compared it with other search engines. But at present they are not showing any ad on their site, we don’t say displaying ads on site is bad, but it must in less number. And one more thing what I find difference is, it provides good results when we search for particular PDF file. Also, another thing is we can easily remember the domain name (PDF Team.com) to search pdf documents easily. They are also having Firefox add-on and Google Chrome add-on to make easy to search pdf document with PDF Team website within the browser search engine. If you want to install PDF Team add-on for Firefox or Google Chrome browser, just visit PDF Team website and have look at the Top navigation menu. It displays add-on based on your browser you are using, means if you visit PDF Team website through Firefox browser, you will get Firefox add-on option, if you visit through Google Chrome browser you will get Google Chrome add-on option. If you don’t want to install any add-on then you can directly visit PDF Team website to search pdf document you want. Just put the file or document name which you would like to search on PDF Team search engine and click SEARCH button, it will display results based on different algorithm. 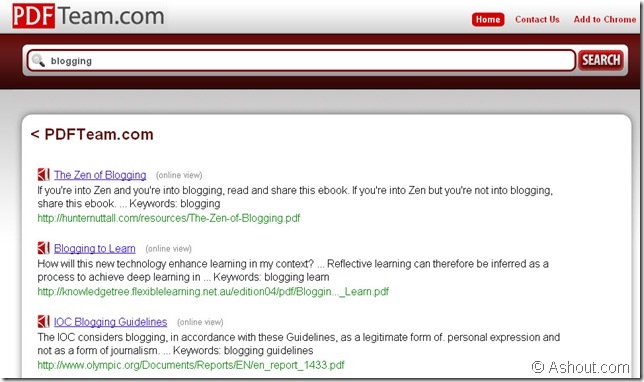 When I search for “blogging” term, it displays good result, because you can see in the screenshot the first result is “The Zen of Blogging” which is one of the popular and free e-book about blogging. You get result with no clutter or ads (I think they will add in feature!) with pdf team search engine. If you often search for pdf files they have a look on PDF Team website and their add-on to your browser.